You’d think it would easy to put a hole in a floor of a building, but it isn’t. The building code (here I’m talking about the International Building Code, or IBC, latest 2009 version) is organized so that code enforcement people can check whether plans for buildings are in compliance with the code, rather than being organized so that architects can figure out what is or is not possible. I made a calculator to help designers figure out whether their proposed holes, connecting two or more floors in a building, are in compliance with the 2009 IBC (similar to earlier versions). I also provide a more detailed discussion of the logic behind making such holes, with an invitation for those more expert than myself to clarify some puzzling code issues. This entry was posted in Architecture, Writings on April 30, 2010 by jonochshorn. This entry was posted in Writings on July 25, 2008 by jonochshorn. Two nights ago, I was lying in bed, thinking about how one might derive the critical buckling load of a column by considering such a column loaded instead like a beam (causing a similar deflected shape). The two equations governing the mid-span moment and deflection of such a beam are, of course, ingrained in my memory (M = wL2/8 and Δ = 5wL4/[384EI]), so it only took a moment to figure out the axial load that would reproduce such a state of equilibrium, simulating the condition of buckling. Since the deflection of a buckled column causes a moment equal to the applied load times the deflection, the critical buckling load must be approximately equal to the beam moment divided by the deflection, i.e., Pcr = wL2/8 divided by 5wL4/[384EI]) = 9.6EI / L2. This is remarkably close to Euler’s famous equation: Pcr = π2EI / L2. Anyway, if you want more details, see my short paper on the subject. This entry was posted in Writings on February 29, 2008 by jonochshorn. I just returned from Hawai’i, where I presented a paper at the Hawai’i International Conference on Arts & Humanities. 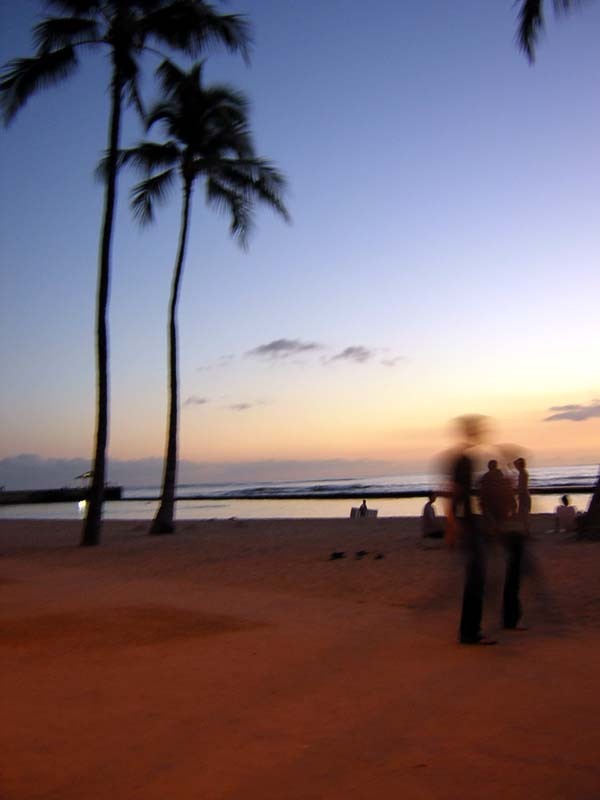 The abstract for the paper was originally targeted for another conference in Washington, D.C., but, having failed to make the cut there, I submitted the abstract to, and it was accepted at, this conference on Waikiki Beach: such are the vicissitudes of academic life. Having arrived in late evening, I took an early morning walk along the beach, waiting for the sun to rise. This entry was posted in Writings on January 16, 2008 by jonochshorn. Not your ordinary sustainability essays: see What Sustainability Sustains and some notes on the LEED 2.2 New Construction Reference Guide. This entry was posted in Writings and tagged green buildiing, leed, sustainability on December 28, 2007 by jonochshorn.